Yesterday I traveled to Washington DC to show support to the group of farmers working to help save the family farm. Seeds have been copy written by some major companies in the United States and Canada. Court cases have been brought against farmers and seed savers by these corporate entities for copyright infringement. A small group of growers and seed houses has filled a case that protection is needed from drifting pollen and resulting lawsuits from these major companies. This was their time to appeal the refusal of a court in New York to hear the case. The attorney on the case is from a law school in New York. He uses the case to teach students in real time how the law works. Most interesting and telling is that the case involves no money. The group of growers and seed houses want to be able to grow and save seed without concern of being involved in court cases. They want protection from the law that we can grow without threat of reprisal for pollen drift: but don't want money from these large companies. Just the ability to grow and save seed without fear of copyright infringement. Seem like a basic human right, so I traveled down there to show support. 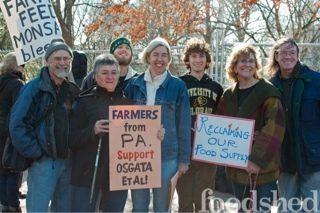 In this picture are farmers from western, central and eastern Pennsylvania. A CSA member. 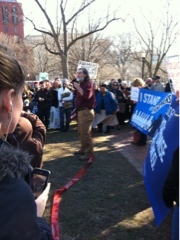 An advocate for GMO labeling on food. And Jim Gerritson, key plaintiff in the case. The panel of judges will hand down a decision later on this year. We are hopeful that it is in favor of seeds that anyone can grow and save.